James Ben Ali Haggin (1827-1914), Lawyer, Mining Financier, Rancher, and Farmer. 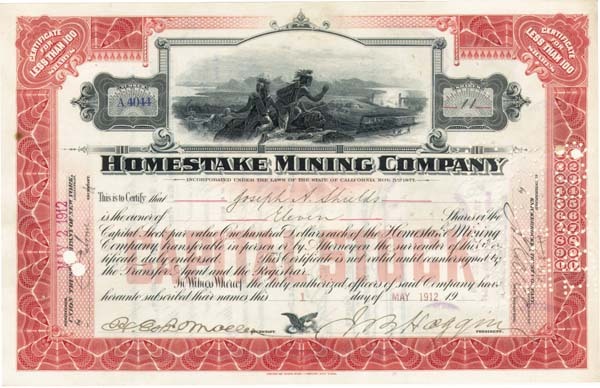 1912 Stock of the Homestake Mining Co. Location, Whitewood Mining District, Lawrence County, Dakota Territory. Signed by J. B. Haggin at front as President. Signature is uncancelled. Superb vignette of Indians overlooking a train. A great American Bank Note Co. Stock. Excellent Condition. Scarce! Special Price!